The Arc de Triomphe du Carrousel is a triumphal arch in Paris. It should not to be confused with larger, and better-known Arc de Triomphe de l'Étoile. The Arc de Triomphe du Carrousel is located to to the West of the Louvre, and the Place du Carrousel (it stands on the site of Tuileries Palace, a former royal and imperial palace which was destroyed in the Paris Commune of 1871). Three arches: a large central arch, flanked by two smaller arches. Eight marble Corinthian columns, each topped with a statue of a soldier of the Empire. Bas-reliefs of the Arms of the Kingdom of Italy, the French Empire, Wisdom and Strength, and of various Napoleonic triumphs. On top of the monument are four horses (quadriga) which are a copy of the Horses of Saint Mark which adorn St. Mark's Basilica in Venice. 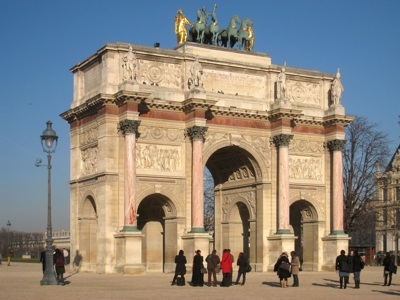 British readers will be interested to know that the design of the Arc de Triomphe du Carrousel, was one of the main sources of inspiration for the design of London's Marble Arch.